1.1.The Website is owned and operated by The Hula Limited (HULA). HULA is registered in the Hong Kong Special Administrative Region of the People's Republic of China (Hong Kong) with company number 2210031 and has its registered office at 5A, Evergreen Industrial Mansion, 12 Yip Fat Street, Wong Chuk Hang, Hong Kong. This also HULA's main trading address. (ii)You consent in particular to HULA processing any personal data it collects from you or that you provide to HULA, and you warrant that all data provided by you is accurate. 1.5.If you sell, buy or rent new or pre-owned luxury goods (Product or Products) through the Website, you are also bound by HULA's Terms and Conditions for Sellers and Buyers. 3.1.The Website is made available to Users free of charge. 3.2.HULA does not guarantee that the Website, or any content on it, will be free from errors or omissions, or that the Website, or any content on it, will always be available or uninterrupted. Access to the Website is permitted on a temporary basis. HULA may suspend, withdraw, discontinue, or change all or any part of the Website without notice. HULA will not be liable to you if, for any reason, the Website is unavailable at any time or for any period. 3.3.You are solely responsible for making all arrangements necessary for you to have access to the Website. 4.1.You may use the Website for the purpose of renting, negotiating, bidding, selling, offering for sale, purchasing, and concluding transactions for new or pre-owned luxury goods, as well as donating to charities, accessing the Website's message board and social networking pages, and in any event only for lawful purposes. 5.2.HULA will not be responsible or liable to any third party for the content or accuracy of any content posted by you or any other User of the Website. 5.4.You are solely responsible for securing and backing up your content. 5.5.The views expressed by other Users on the Website do not represent those HULA holds, nor are these views howsoever endorsed by HULA. (vii)To list, advertise, promote and/or sell unauthorised, illegal or inauthentic goods. (d)Any equipment or network or software owned or used by any third party. (vi)Disclosure of such information to law enforcement authorities as HULA reasonably feels is necessary. 7.3.HULA excludes liability for actions taken in response to breaches of this Acceptable Use Policy. The responses described in this Acceptable Use Policy are not limited, and HULA may take any other action it reasonably deems appropriate. (v)Any other services provided in the Website from time to time. 9.1.You must be at least 18 years of age to form valid and binding legal contracts under the laws of Hong Kong. Therefore, to use the Services available to Users, you warrant and represent that you are of a legal age to form a valid and binding contract. You cannot and must not use the Services of this Website, if you are under 18 years of age or your user account (User Account) has been suspended, removed or terminated by HULA for any reason. 9.2.When you create your User Account you must submit personal information as prompted by the Website's registration form. You acknowledge and accept that your personal information must be true, current, accurate and complete and that you will keep such information true, current, accurate and complete. You are solely responsible for the activity on your User Account, whether or not such activity is authorised by you. If you provide personal information which is untrue, out-dated, inaccurate or incomplete or if HULA has reasonable grounds to suspect that any information provided is untrue, out-dated, inaccurate or incomplete, HULA has the right to suspend or terminate your User Account and refuse any and all current or future use by you of the Website. 9.3.You represent and warrant that, and you will use your best endeavours to procure that no other person whether an individual or corporation other than you will make use of your User Account to use the Website. 9.4.You must not have more than one active User Account. (ii)My Details (Personal Details / Address / Preferences / Status). 9.6.Users must be signed into the Website to access any aspect of their My Account section. This section also enables Users to unsubscribe from HULA's newsletter and/or delete their User Account with HULA. 9.8.If you know or suspect that anyone other than you knows your user identification, code, password and/or any other access codes to the Website you must promptly notify HULA at Hello@TheHula.com. HULA shall not be liable for any damage suffered by you or any loss you incur due to an unauthorised use of your User Account. 9.9.You may terminate your User Account at any time. However, conditions may apply, if you are a Seller within the meaning of HULA's Terms and Conditions for Sellers and Buyers. Please read in particular Clauses 14 (Sellers) and 19 (Buyers) of HULA's Terms and Conditions for Sellers and Buyers. 10.1.Users may invite other non-Users to join the Website (Invitee or Invitees). However, only sellers may invite other sellers. Sellers must only invite trusted Invitees to sell only authentic Products. HULA reserves the right to make the final decision, at its sole and absolute discretion, as to who is eligible to join the Website as a seller. 11.2.HULA, The Hula, and TheHula.com are trade marks and trade names, domain name and company name, and property of HULA. All other trade marks, trade names, domain names, company names and logos are property of their respective owners. HULA does not provide permission to use these trade marks, trade names, domain names, company names and/or logos. 11.3.HULA is the owner or the licensee of all Intellectual Property Rights in the Website and in the material published on it. These Intellectual Property Rights are protected by copyright laws and treaties around the world. All such rights are reserved. 11.5.You may print off one copy and may download extracts of any page(s) from the Website for your personal use and you may draw the attention of others to content posted on the Website. 11.6.You must not modify the paper or digital copies of any materials you have printed off or downloaded in any way, and you must not use any illustrations, photographs, video or audio sequences or any graphics separately from any accompanying text without the prior written consent of HULA. 11.7.HULA's status, and that of any identified contributors, as the authors of content on the Website must always be acknowledged. 11.8.You must not use any part of the content on the Website for commercial purposes without obtaining a license, authorisation or consent to do so from HULA or its licensors. 12.1.HULA is committed to a strict Anti-Counterfeit Policy. As such, HULA only accepts authentic new or pre-owned luxury goods to be offered for sale on the Website and HULA will use its best endeavours to prevent that fake or counterfeited merchandise of any kind will be offered for sale. 12.2.HULA's Anti-Counterfeit Policy is set out in HULA's Terms and Conditions for Sellers and Buyers. 13.1.TO THE MAXIMUM EXTENT PERMITTED BY LAW AND SUBJECT ALWAYS TO CLAUSE 13.3 BELOW: YOUR USE OF THE WEBSITE IS AT YOUR SOLE RISK. THE SITE IS PROVIDED ON AN "AS IS" AND "AS AVAILABLE" BASIS. HULA RESERVES THE RIGHT TO RESTRICT OR TERMINATE YOUR ACCESS TO THE SITE OR ANY FEATURE OR PART THEREOF AT ANY TIME. HULA EXPRESSLY DISCLAIMS ALL WARRANTIES OF ANY KIND, WHETHER EXPRESS OR IMPLIED, INCLUDING BUT NOT LIMITED TO THE IMPLIED WARRANTIES OF MERCHANTABILITY AND FITNESS FOR A PARTICULAR PURPOSE AND ANY WARRANTIES THAT MATERIALS ON THE WEBSITE ARE NON-INFRINGING, AS WELL AS WARRANTIES IMPLIED FROM A COURSE OF PERFORMANCE OR COURSE OF DEALING; THAT ACCESS TO THE WEBSITE WILL BE UNINTERRUPTED OR ERROR-FREE; THAT THE WEBSITE WILL BE SECURE; THAT THE WEBSITE OR THE SERVER THAT MAKES THE WEBSITE AVAILABLE WILL BE VIRUS-FREE; OR THAT INFORMATION ON THE WEBSITE WILL BE COMPLETE, ACCURATE OR TIMELY. IF YOU DOWNLOAD ANY MATERIALS FROM THIS SITE, YOU DO SO AT YOUR OWN DISCRETION AND RISK. YOU WILL BE SOLELY RESPONSIBLE FOR ANY DAMAGE TO YOUR COMPUTER SYSTEM OR LOSS OF DATA THAT RESULTS FROM THE DOWNLOAD OF ANY SUCH MATERIALS. 13.2.NO ADVICE OR INFORMATION, WHETHER ORAL OR WRITTEN, OBTAINED BY YOU FROM HULA OR THROUGH OR FROM THE WEBSITE SHALL CREATE ANY WARRANTY OF ANY KIND. HULA DOES NOT MAKE ANY WARRANTIES OR REPRESENTATIONS REGARDING THE USE OF THE MATERIALS ON THIS SITE IN TERMS OF THEIR COMPLETENESS, CORRECTNESS, ACCURACY, ADEQUACY, USEFULNESS, TIMELINESS, RELIABILITY OR OTHERWISE. 13.3.IN CERTAIN JURISDICTIONS, THE LAW MAY NOT PERMIT THE DISCLAIMER OF WARRANTIES, SO THE ABOVE DISCLAIMER MAY NOT APPLY TO YOU. CERTAIN LEGISLATION MAY IMPOSE CONSUMER GUARANTEES OR IMPLY WARRANTIES OR CONDITIONS OR IMPOSE OBLIGATIONS UPON HULA WHICH CANNOT BE EXCLUDED, RESTRICTED OR MODIFIED OR CANNOT BE EXCLUDED, RESTRICTED OR MODIFIED EXCEPT TO A LIMITED EXTENT. NOTHING IN THIS AGREEMENT SHALL OPERATE TO EXCLUDE, RESTRICT OR MODIFY THE APPLICATION OF SUCH PROVISIONS, THE EXERCISE OF A RIGHT CONFERRED BY SUCH PROVISION, OR ANY LIABILITY OF A PARTY FOR A BREACH OF A CONDITION OR WARRANTY IMPLIED BY SUCH A PROVISION OR A REMEDY IMPOSED BY SUCH A PROVISION. THIS AGREEMENT MUST BE READ SUBJECT TO THESE PROVISIONS. 14.2.TO THE EXTENT PERMITTED BY LAW, HULA EXCLUDES ALL CONDITIONS, WARRANTIES, REPRESENTATIONS OR OTHER TERMS WHICH MAY APPLY TO THE WEBSITE OR ANY CONTENT ON IT, WHETHER EXPRESS OR IMPLIED. (ii)USE OF OR RELIANCE ON ANY CONTENT DISPLAYED ON THE WEBSITE. (v)ANY INDIRECT OR CONSEQUENTIAL LOSS OR DAMAGE. 14.5.HULA SHALL NOT BE LIABLE FOR ANY LOSS OR DAMAGE CAUSED BY A VIRUS, DISTRIBUTED DENIAL-OF-SERVICE ATTACK, OR OTHER TECHNOLOGICALLY HARMFUL MATERIAL THAT MAY INFECT YOUR COMPUTER EQUIPMENT, INCLUDING MOBILE PHONES AND OTHER ELECTRONIC DEVICES, COMPUTER PROGRAMS, DATA OR OTHER PROPRIETARY MATERIAL DUE TO YOUR USE OF THE WEBSITE OR TO YOUR DOWNLOADING OF ANY CONTENT ON IT, OR ON ANY WEBSITE LINKED TO IT. 14.6.HULA assumes no responsibility for the content of websites linked on the website. Such links should not be interpreted as an endorsement by HULA of those linked websites. HULA will not be liable for any loss or damage that may arise from your use of them. 14.7.Different limitations and exclusions of liability will apply to liability arising as a result of the supply of any goods by use to you, which will be set out in HULA's Terms and Conditions for Sellers and Buyers. 15.1.HULA shall bear no liability for damages of any kind, including without limitation direct, indirect, incidental, punitive and consequential damages, including death and/or personal injury arising out of or in connection with any Product and/or the use of any Product bought or rented though the Website. (iii)Your violation of any third-party right, including without limitation any intellectual property or other proprietary right. 17.1.HULA does not guarantee that the Website will be secure or free from bugs or viruses. 17.2.You are responsible for configuring your information technology, computer programmes and platform in order to access the Website. You should use your own virus protection software. 17.3.You must not and you undertake to not, at any time, misuse the Website by knowingly introducing viruses, Trojans, worms, logic bombs or other material which is malicious or technologically harmful. You must not attempt to gain unauthorised access to the Website, the server on which the Website is stored or any server, computer or database connected to the Website. You must not attack the Website via a denial-of-service attack or a distributed denial-of service attack. By breaching this provision, you would commit a criminal offense under the Crimes Ordinance, Chapter 200 of the Laws of Hong Kong. HULA will report any such breach to the relevant law enforcement authorities and HULA will co-operate with those authorities by disclosing your identity and you other relevant details to them. In the event of such a breach, your access to the Website will be blocked and you right to use the Website will cease immediately. 18.1.You may link to the Website's home page provided you do so in a way that is permitted and legal and does not damage HULA's reputation or take advantage of it. Any use of HULA's images, logos or website links must bear the name of HULA as well as the URL of the Website or social media accounts. 18.2.You must not establish a link in such a way as to suggest any form of association, approval or endorsement on HULA's part where none exists. You must not establish a link to the Website in any website that is not owned by you. 18.3.The Website must not be framed on any other site, nor may you create a link to any part of the Website other than the home page. 18.4.HULA reserves the right to withdraw linking permission without notice. 18.6.If you wish to make any use of content on the Website other than as set out above, please contact Hello@TheHula.com. 19.1.Where the Website contains links to other sites and resources provided by third parties, these links are provided for your information and convenience only, and do not constitute an endorsement by HULA. HULA has no control over the contents of those sites or resources and accepts no responsibility for these third party websites or for any loss or damage that may arise from your use of them. 21.1.Any notice to HULA must be in writing and, unless indicated otherwise in these Terms and Conditions, sent by email to Hello@TheHula.com. Any notice or other written communication from HULA to you shall be deemed to be received by you if sent to the email address you have provided in your User Account or any other email address you have provided to HULA. 21.2.Any such notice or written communication shall be deemed to be received by you 24 hours after the email is sent, whereby the date shall be determined according to the local time at the place of receipt. 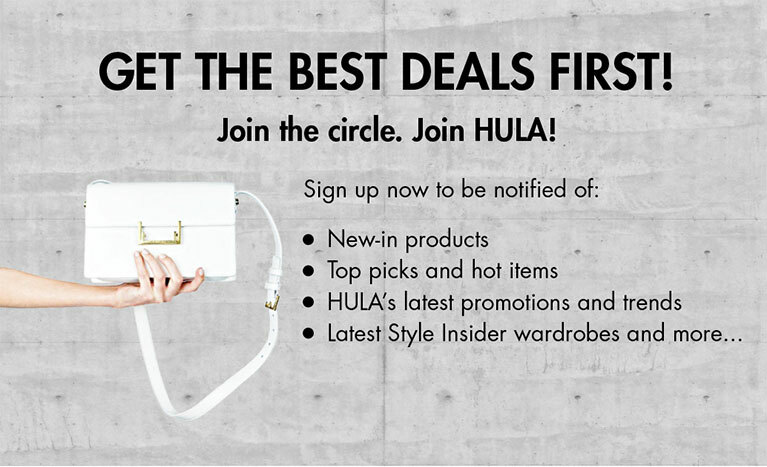 Thank you for visiting www.TheHula.com.